In March 2014, more than two years after President Barack Obama sailed to reelection in a historic sweep of the Latino vote, a powerful ally was about to call him out. The president had been flying high on the success of his Deferred Action for Childhood Arrivals program, or DACA, a legacy-defining executive action that opened up broad horizons for thousands of young undocumented immigrants who were brought to the U.S. as young children. But there was a major wrinkle in his record that the president could not outrun. At a gala that March, Janet Murguía, president of the National Council on La Raza (NCLR), stood before a room full of immigrant advocates and said what many had long been thinking in the back of their minds: Though congressional Republicans were on the hook for blockading comprehensive immigration reform, Obama was not blameless in their community's visceral disappointment. “For us, this president has been the deporter-in-chief,” Murguía said. It was a shocking condemnation coming from one of the largest Latino advocacy groups in the country. NCLR had served as a pipeline of influential leaders who were elevated as advisers in the Obama White House. Yet Murguía's keynote address highlighted the vise squeezing around Obama: From one side, growing public outrage was bubbling in blaming the president for not doing enough to combat illegal immigration; on the other, a burgeoning Latino voting bloc with newly realized political clout was fast becoming disillusioned by the rising toll of deportations. When Obama's eight years in office come to a close, he will be leaving behind a mixed legacy on immigration that is tinged by political impasse and half-fulfilled promises. Congress did not pass comprehensive immigration during Obama's administration; a bipartisan Senate plan stalled in the House. But Obama broke new ground in creating DACA, which gave more than 800,000 young undocumented immigrants known as DREAMers a lifeline, with temporary work permits and protection from deportation. Yet at the same time, more immigrants were forcibly removed from the United States under Obama than any other president. More than 2.8 million undocumented immigrants have been deported over the last eight years, marking a visceral point of conflict for DREAMers who say they have much to owe to the president. “Even though we had millions of deportations, I recognize that my life has been radically different under an Obama administration, more than I had ever imagined,” said Greisa Martinez, advocacy director for pro-immigrant group United We Dream. Now, a chief concern is that Obama's successor, Donald Trump, will take the most aggressive pieces of the current administration's enforcement apparatus and use them to an extreme. “There is a vast network of a deportation structure that will now facilitate Trump’s move to deport millions of people more," Martinez added. Advocates say that adding to Obama's tainted record is the resurgence of a highly contested practice of detaining immigrant women and children, even asylum seekers. After the administration abandoned the controversial policy in 2009, Barbara Hines, former director of the Immigration Law Clinic at the University of Texas, expected that the move marked the ultimate end of immigrant family detention. Instead, Hines saw the policy boomerang back again, with the Obama administration reversing course after a surge in migrants, especially children, crossed the border from Central America. “When he took office he made the decision that family detention was a bad policy. And so he ended the program, only to begin it again on a much wider scale,” Hines said. There was a point within Obama’s reach for him to go down in history as the most pivotal president on immigration since Ronald Reagan. In 2014, Obama unveiled a set of sweeping executive actions meant to build on DACA, expanding the pool of program beneficiaries to nearly 5 million undocumented immigrants. 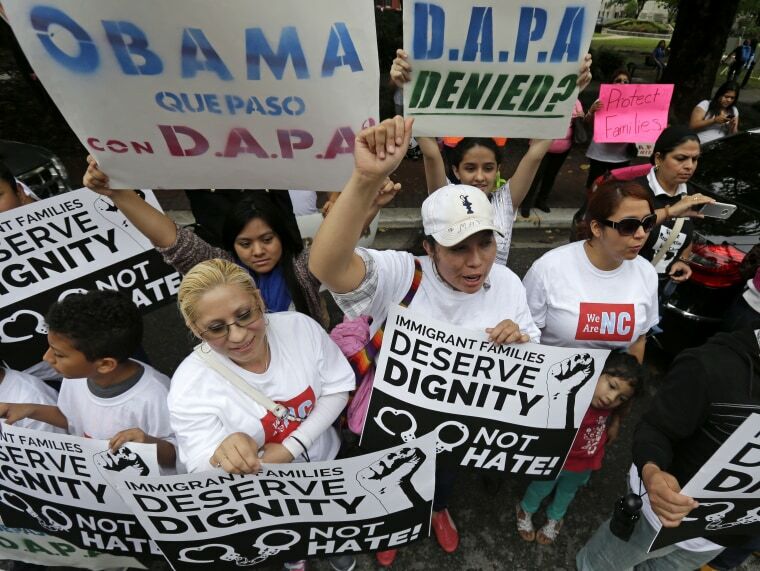 DACA expanded and DAPA, as the actions were known, stood to be a central pillar of Obama's lasting legacy, But a protracted legal battle — led by Texas and 24 other states — went all the way to the Supreme Court before ultimately shattering the hopes of millions of undocumented immigrants who were confident until the very end that they would win protection in the U.S.
“I firmly believe that this administration was on the right side of the law. It’s hard for me to view the outcome as anything but politically influenced, said Shoba Sivasprasad Wadhia, director of the Center for Immigrants’ Rights Clinic at Penn State Law. Despite the bitter disappointment, DREAMers say they have a road map from the Obama years on how to build a grassroots movement that leads to concrete political change. Cesar Vargas, a prominent immigrant advocate who helped organize Latino outreach for Sen. Bernie Sanders' presidential campaign, credits activists and organizers for making the high points in Obama's legacy happen, charting hope for future actions. "DACA, DAPA, all these efforts were a result from the pressure that came from the neighborhoods," Vargas said. "President Obama did not wake up one day and decide to introduce DACA. He was pushed. He was pushed by the DREAMers."